The wedding The wedding is one of life’s primeval and surprisingly unchanged rites of passage. Nearly all of the customs we observe today are merely echoes of the past. Everything from the veil, rice, flowers and old shoes to the bridesmaids and processionals, at one time bore a very specific and vitally significant meaning. 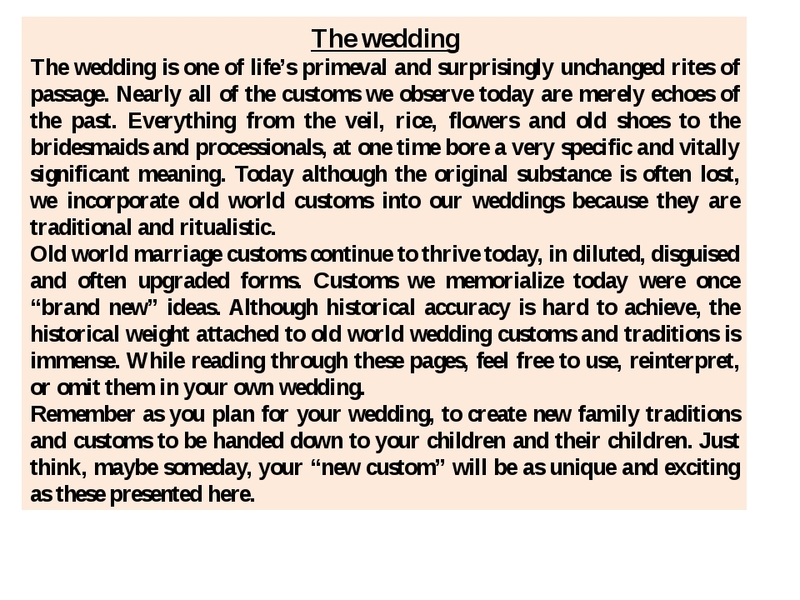 Today although the original substance is often lost, we incorporate old world customs into our weddings because they are traditional and ritualistic. Old world marriage customs continue to thrive today, in diluted, disguised and often upgraded forms. Customs we memorialize today were once “brand new” ideas. Although historical accuracy is hard to achieve, the historical weight attached to old world wedding customs and traditions is immense. While reading through these pages, feel free to use, reinterpret, or omit them in your own wedding. Remember as you plan for your wedding, to create new family traditions and customs to be handed down to your children and their children. Just think, maybe someday, your “new custom” will be as unique and exciting as these presented here. Wedding history Up to and during the middle ages, weddings were considered family / community affairs. The only thing needed to create a marriage was for both partners to state their consent to take one another as spouses. Witnesses were not always necessary, not were the presence of the clergy. In Italy, for example, the marriage was divided into 3 parts. The first portion considered of the families of the groom and bride drawing up the papers. The bride didn’t even have to be there for that. The second, the betrothal, was legally binding and may or may not have involved consummation. At this celebration, the couple exchanged gifts (a ring, a piece of fruit..), clasped hands and exchanged a kiss. The “vows” could be a simple as “Will you marry me” “I will”. The third part of the wedding which could occur several years after the betrothal, was the removal of the bride to the groom’s home. The role of the clergy at a medieval wedding was simply to bless the couple. 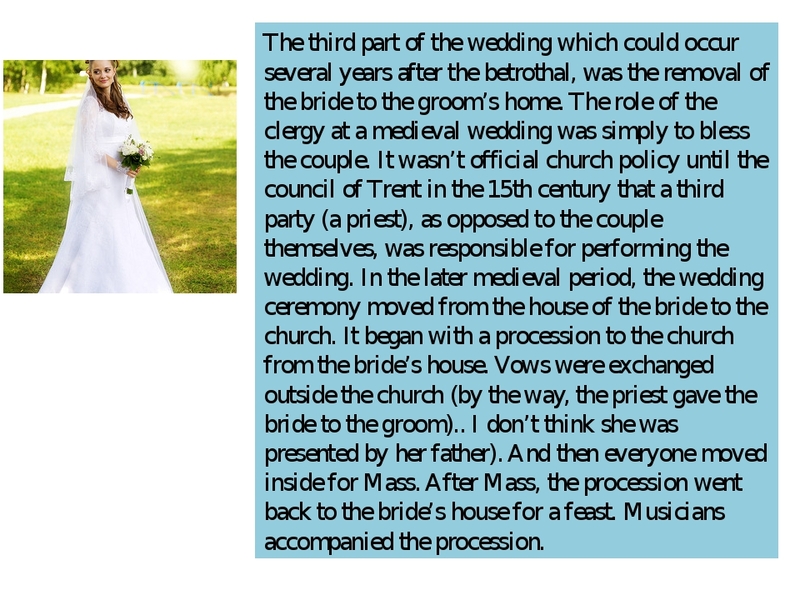 It wasn’t official church policy until the council of Trent in the 15th century that a third party (a priest), as opposed to the couple themselves, was responsible for performing the wedding. In the later medieval period, the wedding ceremony moved from the house of the bride to the church. It began with a procession to the church from the bride’s house. Vows were exchanged outside the church (by the way, the priest gave the bride to the groom).. I don’t think she was presented by her father). And then everyone moved inside for Mass. After Mass, the procession went back to the bride’s house for a feast. Musicians accompanied the procession. 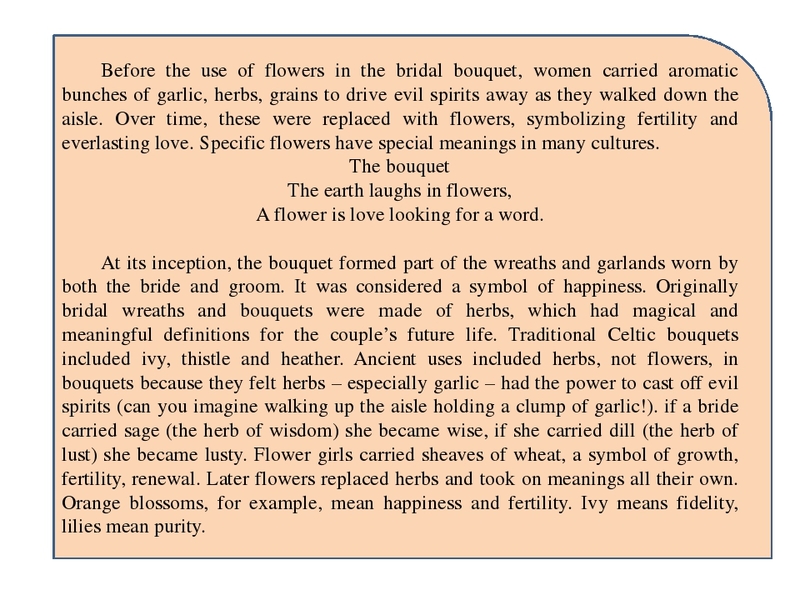 Before the use of flowers in the bridal bouquet, women carried aromatic bunches of garlic, herbs, grains to drive evil spirits away as they walked down the aisle. Over time, these were replaced with flowers, symbolizing fertility and everlasting love. 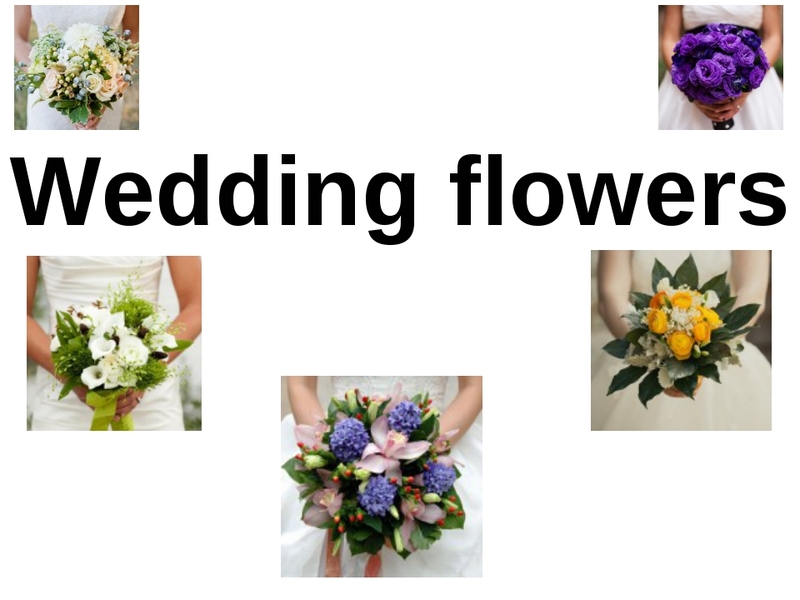 Specific flowers have special meanings in many cultures. The bouquet The earth laughs in flowers, A flower is love looking for a word. At its inception, the bouquet formed part of the wreaths and garlands worn by both the bride and groom. It was considered a symbol of happiness. Originally bridal wreaths and bouquets were made of herbs, which had magical and meaningful definitions for the couple’s future life. Traditional Celtic bouquets included ivy, thistle and heather. Ancient uses included herbs, not flowers, in bouquets because they felt herbs – especially garlic – had the power to cast off evil spirits (can you imagine walking up the aisle holding a clump of garlic!). if a bride carried sage (the herb of wisdom) she became wise, if she carried dill (the herb of lust) she became lusty. Flower girls carried sheaves of wheat, a symbol of growth, fertility, renewal. Later flowers replaced herbs and took on meanings all their own. Orange blossoms, for example, mean happiness and fertility. Ivy means fidelity, lilies mean purity. White has long been accepted as the traditional colour of the wedding dress, but wedding gowns were not always white. The marriage of the Queen Victoria to her cousin Albert of Saxe- Coburg in 1840 has had more influence on weddings than any other. Queen Victoria put the wheels in motion by marrying in white. Though brides continued to wed in gowns of different colours, white was now set as the color of choice for weddings and has continued ever since. In Godey’s Lady’s Book, 1849, this statement was printed “Custom has decided, from the earliest ages, that white is the most fitting hue, whatever may be the material. It is an emblem of the purity and innocence of girlhood, and the unsullied heart she now yields to the chosen one”. There is an old poem about how the color of your wedding dress will influence your future “Married in white, you will have chosen all right. Married in grey, you will go far away. Married in black, you will wish yourself back. Married in red you will wish yourself dead. Married in blue you will always be true. Married in pearl you will live in a whirl. Married in green ashamed to be seen. Married in yellow ashamed of the fellow. Married in brown you’ll live out of town. Married in pink, your spirits will sink. Wedding myths quiz Here comes the bride, all dressed in ..blue? Why do brides wear white, anyway? Take this quiz and see if you know the truth behind wedding traditions associated with tying the knot. T/F Rice should be thrown at weddings because it is potentially harmful to birds. T/F The tradition of the white wedding dress dates back hundreds of years T/F June is by far the most popular month for weddings T/F Saturday is the unluckiest day to get married, according to English folklore T/F Engagement and wedding rings are worn on the fourth finger of the left hand because it once was believed that this finger had a vein that led directly to the heart T/F Valentine’s Day is the most popular time of year for marriage proposals T/F Saturday, July 7, was the most sought after wedding date for 2007. T/F The white wedding dress traditionally symbolizes the virginity of the bride T/F The tradition of the diamond engagement ring began as a 20th-century marketing campaign by the diamond industry T/F Many vendors – such as caterers, florists and photographers – charge more for weddings than they do for other events. The wedding is one of life’s primeval and surprisingly unchanged rites of passage. Nearly all of the customs we observe today are merely echoes of the past. Everything from the veil, rice, flowers and old shoes to the bridesmaids and processionals, at one time bore a very specific and vitally significant meaning. 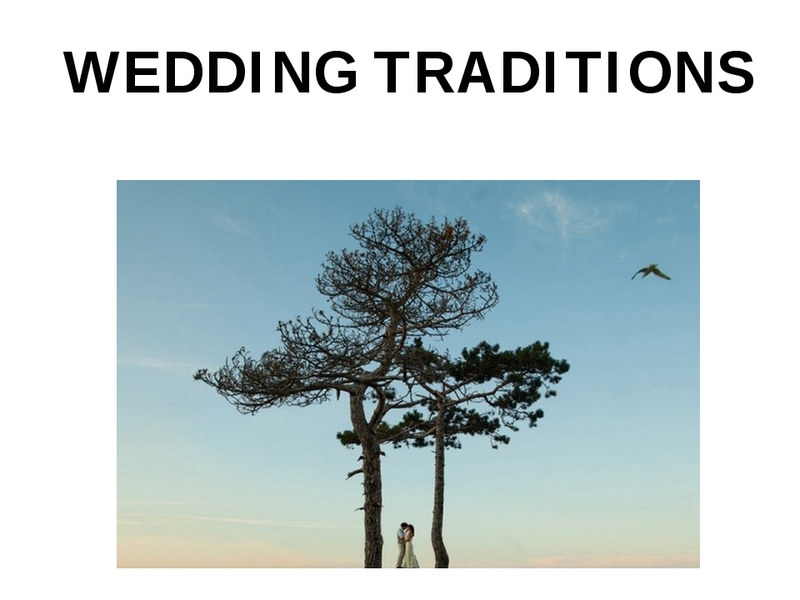 Today although the original substance is often lost, we incorporate old world customs into our weddings because they are traditional and ritualistic. Remember as you plan for your wedding, to create new family traditions and customs to be handed down to your children and their children. Just think, maybe someday, your “new custom” will be as unique and exciting as these presented here. Up to and during the middle ages, weddings were considered family / community affairs. The only thing needed to create a marriage was for both partners to state their consent to take one another as spouses. Witnesses were not always necessary, not were the presence of the clergy. 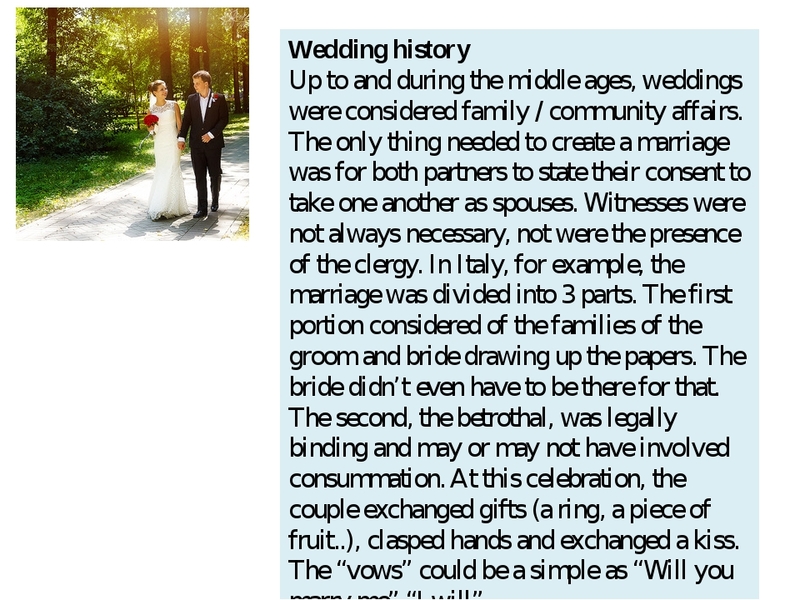 In Italy, for example, the marriage was divided into 3 parts. The first portion considered of the families of the groom and bride drawing up the papers. The bride didn’t even have to be there for that. The second, the betrothal, was legally binding and may or may not have involved consummation. At this celebration, the couple exchanged gifts (a ring, a piece of fruit..), clasped hands and exchanged a kiss. The “vows” could be a simple as “Will you marry me” “I will”. Before the use of flowers in the bridal bouquet, women carried aromatic bunches of garlic, herbs, grains to drive evil spirits away as they walked down the aisle. Over time, these were replaced with flowers, symbolizing fertility and everlasting love. Specific flowers have special meanings in many cultures. At its inception, the bouquet formed part of the wreaths and garlands worn by both the bride and groom. It was considered a symbol of happiness. Originally bridal wreaths and bouquets were made of herbs, which had magical and meaningful definitions for the couple’s future life. Traditional Celtic bouquets included ivy, thistle and heather. Ancient uses included herbs, not flowers, in bouquets because they felt herbs – especially garlic – had the power to cast off evil spirits (can you imagine walking up the aisle holding a clump of garlic!). if a bride carried sage (the herb of wisdom) she became wise, if she carried dill (the herb of lust) she became lusty. Flower girls carried sheaves of wheat, a symbol of growth, fertility, renewal. Later flowers replaced herbs and took on meanings all their own. Orange blossoms, for example, mean happiness and fertility. Ivy means fidelity, lilies mean purity. 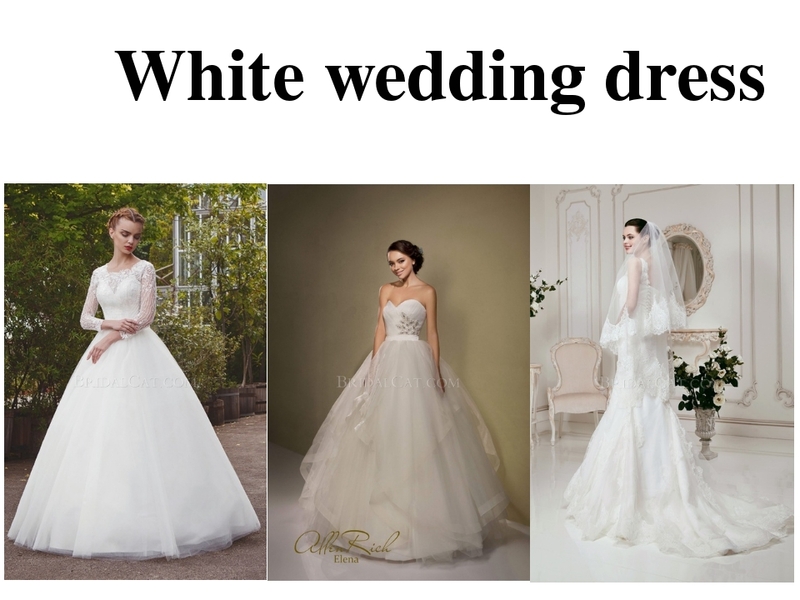 White has long been accepted as the traditional colour of the wedding dress, but wedding gowns were not always white. The marriage of the Queen Victoria to her cousin Albert of Saxe- Coburg in 1840 has had more influence on weddings than any other. 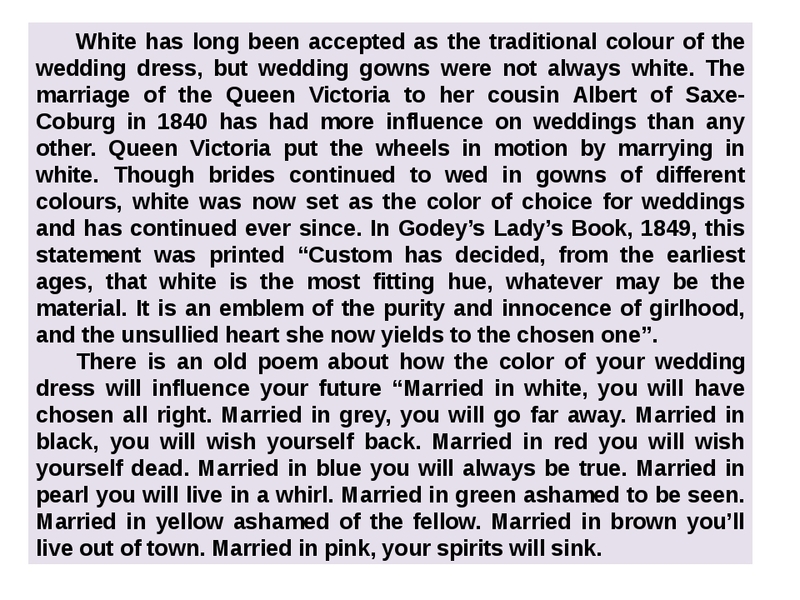 Queen Victoria put the wheels in motion by marrying in white. Though brides continued to wed in gowns of different colours, white was now set as the color of choice for weddings and has continued ever since. In Godey’s Lady’s Book, 1849, this statement was printed “Custom has decided, from the earliest ages, that white is the most fitting hue, whatever may be the material. It is an emblem of the purity and innocence of girlhood, and the unsullied heart she now yields to the chosen one”. There is an old poem about how the color of your wedding dress will influence your future “Married in white, you will have chosen all right. Married in grey, you will go far away. Married in black, you will wish yourself back. Married in red you will wish yourself dead. Married in blue you will always be true. Married in pearl you will live in a whirl. Married in green ashamed to be seen. Married in yellow ashamed of the fellow. Married in brown you’ll live out of town. Married in pink, your spirits will sink. Here comes the bride, all dressed in ..blue? Why do brides wear white, anyway? Take this quiz and see if you know the truth behind wedding traditions associated with tying the knot. 1. T/F Rice should be thrown at weddings because it is potentially harmful to birds. 7. 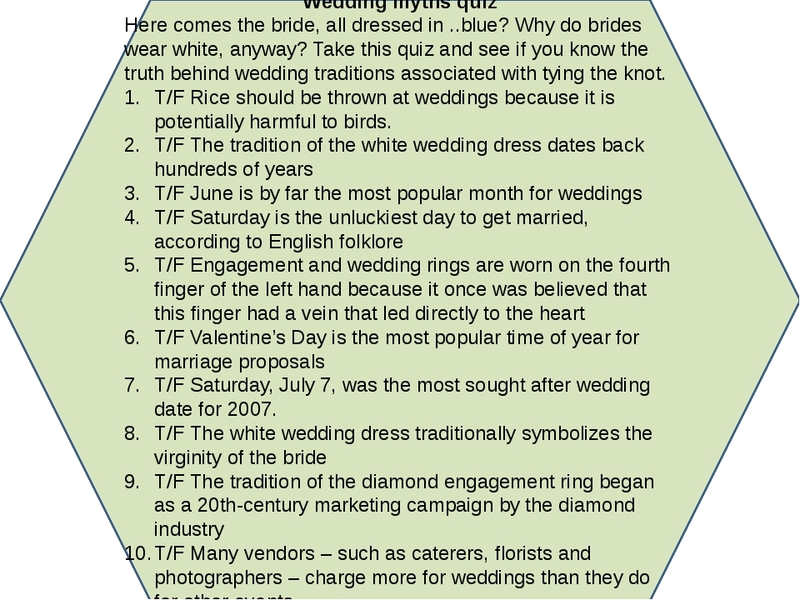 T/F Saturday, July 7, was the most sought after wedding date for 2007. 10. T/F Many vendors – such as caterers, florists and photographers – charge more for weddings than they do for other events.